What is your favorite movie featuring primarily military BASIC TRAINING? The Westernized grandson of a shaman returns to the wilderness to learn more about his Native American heritage. When he encounters powerful evil spirits, he enlists the aid of his lover and a local chief to stop the spirits. Comedy subtly dealing with moral issues such as racial bigotry, corporate greed, American belief of societal superiority and hypocrisy. A Marine Corps drill instructor who is disgusted by the fact that the Corps now accepts draftees finds himself pitted against a hippie who has been drafted but refuses to accept the military's way of doing things. A young man who dies in an auto accident returns from the dead to meet up with the young woman who tried to save him. After oil is found in a small town and local factory shut down, violent crime skyrockets. A young man has had enough and calls in his older brother, a cynical Vietnam vet, who cleans the streets but then tries to take over the town. Courage was something you found. Love was something you won. Very appealing stateside WWII drama stars then-hot Jan-Michael Vincent as Marion "Hedge" Hedgepeth, who, before long, flunks out of his basic training as a Marine, and is sent home in a baby blue uniform in disgrace. During the journey, he encounters an actual young veteran (Richard Gere, in a memorable bit) who's desperate to avoid being sent back into battle. So the vet mugs Hedge (well, so to speak...he actually LEAVES him a few dollars), and all Hedge has to wear is the vets' uniform. On his way back home, he stops in a small Colorado town, and is naturally thought to be a war hero by the locals. He's so endearing to them, and they to him, that he can't bring himself to tell them the truth. Written by Stanford Whitmore ("Hammersmith Is Out", "The Dark"), and directed by John D. Hancock ("Let's Scare Jessica to Death", "Bang the Drum Slowly"), this is an enjoyable little film worth rediscovering. While not altogether believable (for some reason, there's a Japanese internment camp right in the woods near this town), it gets by on a certain amount of charm, just like its lead character. In fact, a citizen named Hudkins (Bert Remsen), with whose daughter Rose (Glynnis O'Connor) Hedge falls in love, surmises that he's too *nice* and *innocent* to seem like a hardened killer. Overall, the film does get pretty dramatic, and takes on the tone of a fable, but it never veers too far into unpleasantness. 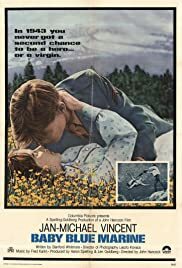 Excellent location shooting in & near the California towns of Weed and McCloud gives it atmosphere and a fine feeling of Americana, and the score by Fred Karlin is excellent. Vincent was then at the peak of his career as a leading man in film, and he couldn't be more likable. O'Connor is adorable as the romantic interest, and Katherine Helmond, Dana Elcar, Bert Remsen, Bruno Kirby, Gere (sporting shocking bleach blonde hair), Art Lund, Michael Conrad, Allan Miller, Kenneth Tobey, Lelia Goldoni, Marshall Efron, and Barton Heyman comprise a rock solid supporting cast. Adam Arkin has one of his earliest big screen roles as a boy named "Rupe". Well worth a look, especially if you like cinema set during this period, or are a fan of Vincent.